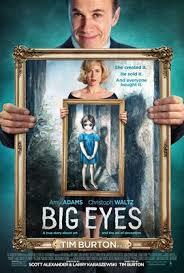 Review: Based on a true story about Walter Keane, who was one of the most successful painters of the 1950’s and 1960’s. He started earning staggering amounts of money. Eventually the truth would be discovered that Keane’s art was not actually created by him but by his wife, Margaret. He was catapulted into international fame while taking credit for her work. I did find these paintings very creepy and very frightening. I am not really sure whether I would want one of the paintings hanging up in my own home. Ahead of the release of the film, sales for Margaret Keane’s paintings soared. The small paintings sold for $8,500 a piece. Tim Burton owns an extensive collection of her work. This is one of the better films from Tim Burton. I did actually care about the characters all the way through this. You believed in them all. Whether it was because it was based on a true story and therefore you had more sympathy with them. I found this really interesting and did not know anything about the story. Not sure at the time whether it got any coverage (about the scandal) over here in the U.K. I do not know. This isn’t Amy Adams’s best film but think that she gives a terrific performance. Before she started filming she consulted the real Margaret Keane who was in the late 80s. I also thought that Christoph Waltz was very good but he does specialise in creepy roles. The screenplay worked really well and was really thought out. Completion of this film took 11 years. Film critic Mark Kermode wrote in his review about this “This is a tale about a woman finding her own voice in a chauvinistic environment, escaping the shackles of an abusive marriage to step into the spotlight alone.” At the Golden Globe Awards in 2015 this won for Best Performance by an Actress in a Motion Picture – Comedy or Musical (Amy Adams).